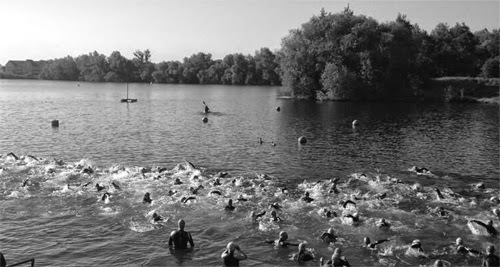 I’ve never taken part in an open water triathlon this early in the year before and I was pretty worried about how cold the water might be. It was actually a ‘balmy’ 13 Celsius. This doesn’t sound that warm but it was actually warmer than the air temperature. The weather was poor. It was chilly but also the rain was tipping down the whole time. Sometimes triathletes can be wimps. Before the start all these guys in wetsuits went in to a shed next to the lake and stood about shivering and hugging themselves. We were going in to the lake a few minutes later so not sure why anyone was so bothered about staying dry! I really found the bike hard going in the heavy rain. The bike leg was down a dual carriageway and there were huge puddles which I wasn’t sure if they were just normal puddles or covering pot holes. Falling in those conditions with cars coming past at high speed could have been messy. I played it safe and probably lost a lot of time as a result. I was a good bit slower than in 2011 and 2013. The bike leg has been different every year and in previous years it was later in the year and the weather was a lot better so it’s not a straight comparison.